On Erasure’s last release, Other People’s Songs, Vince Clark and Andy Bell sounded tired. Their bag of tricks had been spent, reducing them to an album of poorly constructed cover songs, and even though it pushed the duo back onto the radar in America, it was quite easily their worst effort to date. Nightbird is a resurrection of sorts, with its bubbling analogs and dancey pop hooks. 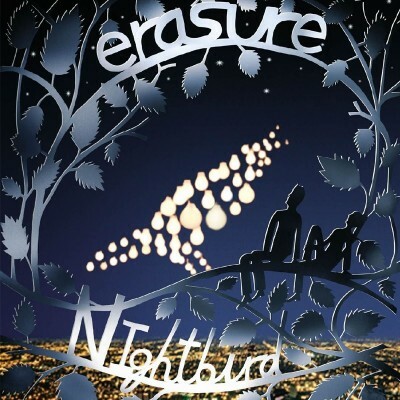 Granted, it doesn’t have the highs of The Innocence or Chorus and isn’t as experimental as their overlooked self-titled masterpiece, but it is a return to what lifted Erasure towards the top above the vast synthpop field in the 80s and allowed them to endure the 90s when the press turned their noses upward at the lighthearted nature of Erasure’s music by devoting their allegiance to the Pet Shop Boys, who had redefined themselves as serious musicians. I think 2005 needed a solid pop album full of love and distraction and in Nightbird, Erasure have delivered it. This review originally appeared in Glitter Gutter Trash, April 2005, Issue 196.